Psalm 40:9-10 (NLT) I have told all Your people about Your justice. I have not been afraid to speak out as You, O Lord, well know. I have not kept the good news of Your justice hidden in my heart; I have talked about Your faithfulness and saving power. I have told everyone in the great assembly of Your unfailing love and faithfulness. Psalm 82:3-4 Defend the cause of the weak and fatherless; maintain the rights of the poor and oppressed. Rescue the weak and needy; deliver them from the hand of the wicked. What is YOUR calling in this life? Do you know? If not, do you want to know how to find out? Ask Him! Spend time alone with God and His Word. Don’t let go until He shows you your specific purpose for your life. 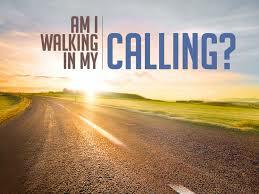 If you do know your calling, are you walking in it? If not, why not? What are you waiting for? There is no one on earth who can do what He has for YOU to do! Be encouraged today to not only find your mission in this life, but to walk boldly in it – no matter how you feel, no matter what comes against you!